Boy, Triumph knows how to stir the pot of ingredients. First there was the Bonneville, then the T100, America, T120, Thruxton, Scrambler, Street Cup, Street Twin and now the Street Scrambler. They’ve all sold well; going retro has really worked for Triumph. The Street Scrambler is not, despite the name, a ‘scrambler’ in any sense other than styling. Nor do the power figures promote a sense of longing; 55bhp and 80Nm of torque. But you have to completely ignore these slight negatives because they do not tell nearly the whole story. 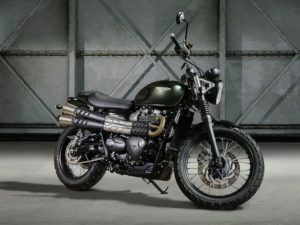 What you get in the Street Scrambler is a fantastic little bike; the engine is super smooth and punchy, the chassis solid and it has all the style that once made Triumph the most desirable of British bikes when competition from its British rivals was at its fiercest. It’s beautifully made and goes just as well as it looks. It is, at the same time, a plaything as well as a perfect bike for the urban jungle. Sharing, as it does, the chassis and engine from other Triumph retro models, it is remarkable how the Street Scrambler has its own distinct personality and it proves how a stratospheric power output is not necessarily the pre-requisite for a good bike that’s fun to ride.